These days, I like to eat my bananas when they're still a little green. Once they're much past that, I need to find some other way of eating them. 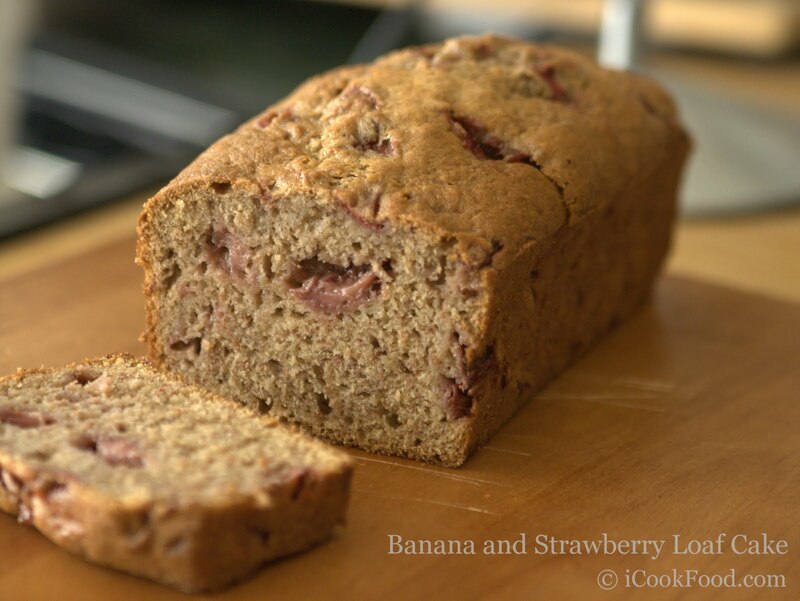 When looking around at Banana Bread recipes, I found a couple that also added strawberries, and with them in season right now, I thought it was definitely worth giving that a try. The cake definitely went down well with most people that tried it. The strawberries seem to add a little extra moisture as they sort of disintegrate to a certain extent, plus the cake was fairly light. So that the texture isn't too open, I suggest cubing the strawberries that you mix directly into mixture fairly small, then just keep a couple of good looking strawberries back to slice and put on the top before putting in the oven. Some recipes suggested adding sour cream to keep the cake moist too, however, as one of the guys in the office is allergic to dairy, I decided to leave that out and use Soya Butter too. I may try one day with Sour Cream too, although from a moisture point of view, I don't think this recipe needs it. Preheat the oven to 180°C. Beat Sugar and Butter together in a bowl until smooth. Add the beaten eggs and mix together. Add the Vanilla, Cinnamon, Ginger, Baking Powder, Bicarbonate of Soda and mix. Mix in the mashed Banana and Flour until you have a smooth mixture, then finally add most of the strawberries, keeping a few back to drop on the top if there are none showing after you pour the mixture into the loaf tin. Pour the mixture into a greased 400g (half pound) loaf tin (lining with some baking parchment makes it really easy to extract afterwards). If there aren't any strawberries showing on the top, drop a few of the reserved ones on the top and half poke then in, so that you get a nice display of them on top when it's cooked. Put in the oven for 45 mins, then lower the temperature to 160°C for another 45 minutes. You should probably check it with a skewer after about an hour's total cooking time, but for me, 45 mins at 180° followed by 45 mins at 160°C works perfectly, and still results in a nice moist cake. Leave to rest in the tin for a few minutes, then carefully transfer to a wire rack to cool down.